Reform Rx – Missing Snowe & Collins, Inc. The Maine Senate delegation serving corporate interests need to leave office when their terms are up. From Susan Collins’ refusal to engage Maine citizens in any substantive way on health care reform to Olympia Snowe’s dashing any hopes for a Maine voice of reason supporting a robust set of health care reforms, I am resigned to dismissing their poor representation of us as their usual game. They have not lived up representing their constituents fairly. In the meantime, we are saddled with their inadequate grasp of domestic issues in particular and their peculiar allegiance to outside corporate interests who are not interested in Maine citizens, save a bit of financial extraction of our modest to poor means for their profits. While I realize we must press them on every key issue while they remain in office on the slight hope that they might consent to bargain for something that steers them into representing us by accident, it is time for them to leave when their term is up. Based on their actions regarding health care reform, that’s the best Rx. - The false proclamations of moderation used to cover their conservative Republican voting records. - The outside Maine media panting for our Senators’ to go against the grain only to find out once again that they are made of conservative Republican fiber. - The endless wooing dances to get one of them on board as a bipartisan backer but getting stepped upon by their demands for changes that destroy intent and effectiveness. - The myth that they are good old rock bed rugged individuals who speak independently for like-minded Maine citizens except when a campaign contribution or corporate financial interest is at stake. - The right wing smoke screen about RINOs and Republican purity setting them up as victims of the right while they march, with a very few limited minor exceptions, lockstep with the conservative band. - The avoidance tactics, hollow moderate credentials burnishing, dismissing attitudes by their staffs, chuckling comments at our expense, and the deterioration of authentic Maine representation and examples of real bipartisan leadership given us by Margaret Chase Smith, Edmund Muskie, Bill Cohen, and George Mitchell. Tomorrow is the day that we may see Senator Snowe publicly cast a vote regarding the public option. The Baucus bill mark up process will include amendment votes on including a public option in the bill unless another tactical delay occurs. While we suspect that Senator Snowe will oppose inclusion of a robust public option, you can still urge her to change her mind. You can contact her office in DC to ask her to support a strong public option and drop her backing of any triggered public option. It will likely be busy; put it on speed dial and keep trying! Senator Snowe is being given the opportunity to join the 58% of Maine citizens that want a public option to compete with insurance companies by truly representing our interests over corporate profits. If Senator Snowe votes NO, she might well represent the "kill" vote on the public option for the Baucus bill. The Senate Finance Committee was barely an hour into its consideration of health-care reform on Tuesday morning, but Sen. Jim Bunning (R-Ky.) already knew where he stood. "I do not support a government takeover of the health-care system," he railed. The proposal "confiscates more money from the taxpayers," he went on. "It tramples on American freedom and liberties." After this vigorous display of open-mindedness, Bunning was spent. About an hour later, spectators noticed that the senator, who had been resting his chin in his hand, had fallen fast asleep. As giggles rippled through the chamber, an aide shook Bunning, who woke with a start. Senator Bunning is one of those Republicans who will not be voting for health care reform in any way, shape or form. I suppose many a hard working Senator has nodded off at a hearing but it is especially poignant that Jim Bunning has in the past questioned if Senator Harry Reid gets enough sleep to make rational decisions. While amusing, the sad outcome of this tale is that Republicans have a la-la fantasy dream about the United States having the best health care in the world but are ready to condemn all of us to the nightmare realities of poor health outcomes, lack of access, insurance company indifference, and medical impoverishment or bankruptcy. Wake up call: Check out this Bunning - Snowe activity today. Senator Collins is not swayed by messages about health care. She does not hear the voices of Maine citizens who need workable health care reform and a public option. She ducked out this summer on a nine day overseas trip and refused to connect with constituents or publicly seek their opinions. Now it seems there is no way to reach her. "I don't think the members of the delegation nor the people of Maine are influenced by political ads that are run by out-of-state groups advocating positions," Collins told Capitol News Service. "We saw that when I was up for re-election last year, when a lot of groups were running attack ads against me." It appears that Senator Collins apparently believes that an ad on health care reform is an “attack ad”. Many of us have written to our Senators. I and many others urged all of us to do so. And I made sure to take the time and write to both Olympia Snowe and Susan Collins about my perspective as a Maine citizen on our health care needs. From Senator Snowe, I got a two and a half page single spaced explanation of her inclinations and involvement that discussed the issue. I did not agree with her on everything but she was engaged and concerned. From Senator Collins I received a four sentence pro-forma “thanks for writing; appreciate it” reply. No perspective or position included at all. Senator Collins is not engaged on health care reform. She is not engaging with her constituents in a manner that is appropriate to her office. Susan Collins is dissing us. Dissing is slang but is the perfect word for describing the disrespecting, disparaging, dismissing behavior which she is engaging in with regard to the citizens of Maine on health care. Reform Rx - "A Little Respect (Just a little Bit)"
Ok, I’m going to do this just once. Olympia Snowe, do a Jim Jeffords; pull an Arlen Specter. Leave the party that left you long ago; show loyalty to principle. Have a Margaret Chase Smith moment. The Republicans have not drifted a bit right; they have jumped to destructive political tactics and downright obstructionism at any cost. Democratic activists in Maine may not have supported you in elections but we can do math. Many Democratic voters have supported you and Independents with moderate views have also. These two groups are following closely health care reform and identifying Republicans as the party that dismisses real needs, does not care about them, and laces our national dialog with fear and false charges. The boat is sinking and the other passengers are still poking holes in it; time to jump ship. Come on in, the water is fine, Democrats would welcome you, Independents would continue to respect you, and Republican moderates in Maine will continue to support you. That leaves only an extreme right residue that disowns you already derisively as a RINO. You can become a Democrat or if that’s a bit too much all at once, declare yourself an Independent. Either way, you’ll roll up an impressive George Mitchell style reelection victory as a result. Not running? We don’t need to know about that but you can retire with respect, dignity, and adding a historic voice to reason. The real thrust of this proposal is to get you to caucus with the Democrats. Sure, you hold negotiation power now as the fleeting light of possible bipartisanism flashes and surely fades. But citizens are not blind; there isn’t any true bipartisan action on health care and we know it. Despite some declarations, Americans really do not care if there is a technical bipartisan imprimatur on health care reform as long as it works for them. If you choose to follow your instincts and do something substantive about health care; the right will tear you down to greater degree than presently. Your impact as a Republican will be reduced as that caucus plays to its narrow extremist base. In the Democratic caucus you might not become the immediate darling of every activist but you will have true R-E-S-P-E-C-T. And because the Republicans will frustrate you on every single future issue after health care since you did not assist them in breaking President Obama, you will be in a caucus where you can have impact. Robert Reich hits the nail on the head with his blog entry yesterday, “Why Olympia Snowe Should Vote Against the Baucus Plan”. Indeed, we might as well reconcile ourselves to seeing our Maine Senators’ decisions on health care change as leading med-onomic indicators of bad reform. But Robert Reich’s scenarios are very plausible. If Snowe votes for Baucus, we bop down the road to feeble reform; if Snowe, votes against Baucus, no matter her logic, the dance floor may open to robust reform. Thus let us hope Senator Snowe will vote against the Baucus bill as it is currently written. Occasionally accidental representation occurs. There is also a third scenario where the Baucus bill is reshaped into a good bill via the amendment process from Senators such as Jay Rockefeller. Then, we’ll need to put Senator Snowe back on our dance card. Let us hope Senator Snowe then has a Margaret Chase Smith moment and considers her conscience. There are a few times in a long Senate career that there are vital matters of overwhelming importance that distinguish leaders and directly affect the very lives of constituents in a way that will last well beyond a Senate career. Some of these times present fundamental choices between clear constituent needs and very powerful influences. This would be one of those times. Yesterday after Max Baucus released his bill, it won an immediate endorsement from health care industry. Shares of UnitedHealth Group Inc. (UNH), HealthNet Inc. (HNT), Humana Inc. (HUM), Aetna Inc. (AET), and Cigna Corp. (CI) all reacted by rising at the prospect of mandating coverage without public option competition. To be fair, the Baucus bill, may improve selected things a little bit but it is not change we can believe in. It is like finding out from the doctor that you broke your leg in one place instead of two...you still have a broken leg and the bill will likely not be much cheaper. For a brief on the good, bad and ugly on the Baucus bill check out this TPM piece by Brian Beutler. And the right has its own set of good, bad and ugly comments too. Reform Rx - Time to pick a bill. The Baucus bill reported out today is the Senate go-it-alone offering. This bill may pass in a pretty watered down version but the outcome of health care reform will be decided in the House/Senate conference committee negotiation between a limping and weakened offering designed to attract a Republican Senator or two over the needs of millions of citizens and the bill that addresses our needs that is now in the house as HR 3200. I believe the solid testimony by Wendall Potter that compares the above bills is very revealing. It is time to choose a horse and back it. Senator Snowe is walking away from a plan that she says will increase costs for Maine citizens. She is probably right but it is ultimately due to her rejection of a robust public option from the start. Maine citizens needed a strong government plan to compete with all insurance companies on a nation level that would in turn force prices down within our narrow Maine insurance market. Senator Snowe enabled killing the public option and now walks away and abandons us. It’s a case of the fox giving up guarding the henhouse because she already ate all the chickens. Senators Snowe and Collins have given us their positions clearly after an extraordinary effort to convince each of them of the needs of Maine citizens for substantive health care reform with a robust public option. They coldly, with no persuasive reasoning, smilingly reject our health care needs and sentence us to the status quo. Senator Snowe continues to urge rejection of a pubic option. Senator Collins rejects a public option or even a triggered one. While I do believe we elect representatives to use their best judgment and not just parrot the majority whims; this is an instance where their conclusions are so defective that it must become a watershed characterization of their terms in office. Only the State of Status Quo is well represented. The letters, calls, faxes, office visits, protests, vigils, and other efforts must go on because we citizens need to carve out a public record to create the long memory necessary to replace Senators Snowe and Collins with representation aligned with our needs. Phil Rosenthal asks questions you can count on. "Will there be a tougher, more pressure-filled job the next few years than being the accountant who does Glenn Beck's taxes? Would someone please, please, please on this latest promo tour ask Rod Blagojevich to rank, in order of price, his new book, his dignity and Obama's former U.S. Senate seat? Is it true that if you play "The Beatles: Rock Band" video game backward, it tells you to play "Grand Theft Auto 2" and III? What are the odds someone in Congress starts yelling out stuff at Obama like they do at the town hall meetings on health care? So after shutting down Michigan Avenue, what does Winfrey do for an encore next year, shut down Michigan state?" Quite a prediction but perhaps not all that remarkable considering the Republican Party's move to the three "Rs": Rejection, Rudeness, Reactionary. Reform Rx - ACTION ALERT! Today, this week, and into the future, Senator Snowe is going to be hearing from her constituents. Snowe, a member of the so-called Gang of Six on the Senate Finance Committee, which is under intense pressure to work out a compromise on the complex and potentially far-reaching legislation, coolly insists bipartisanship is the only answer. "It isn't a question of working with the Democrats," said Snowe, one of the three GOP negotiators. "It's working on a bipartisan basis to see if we can do the right thing for this country." She would create a public health insurance option only if private insurers prove unwilling or unable to meet certain affordability targets. Nonprofit agencies, she proposes, would offer health insurance only if private insurers could not cover 95 percent of the people in their regions with plans costing no more than about 15 percent of a person's or a household's annual income. It's good to know Senator Snowe is still open to negotiations in Washington. But it matters a lot more what people in Maine think about health reform. There is no doubt that Mainers are hurting right now. Premiums in Maine are increasing almost six times faster than wages in the last seven years [pdf]. Families are paying over $1,000 more per year for health coverage. The situation is worse for businesses, who are paying well over $4,000 more per year per employee for coverage. The two biggest insurers in Maine control 88% of the market [pdf], meaning Mainers have no choice when it comes to health insurance. All this combines to squeeze Mainers hard: 70 are losing their insurance coverage every day [pdf]. Senator Snowe can fix this if she stands up for her constituents over the health insurance lobbyists. She can support health reform that lowers costs, improves coverage, and gives Mainers a choice of a public health insurance option that's national and available on day one to keep the insurance industry honest. If you live in Maine, sign the petition to Senator Snowe urging her to do just that. Senator Snowe should negotiate for real health reform that helps her people back home. Because if the insurance industry wins when it comes to health reform, Mainers lose. Let’s ask ourselves: Why concede to what they reject in their hearts? Under the trigger proposal, a public option would become available later, should the private insurance industry not meet certain benchmarks on coverage and cost. A very informative and personal story in today's Kennebec Journal about what owners of small businesses constantly face in the struggle between pursuing an entrepreneur's path and the burdensome cost of paying for 100% of their health care unlike employees of larger entities. …except when it comes to leveling the playing field with large companies by providing reasonable health care for small firm owners and employees. …except when it means giving small business an equal opportunity to attract talented employees by allowing health care portability or a seamless government option. 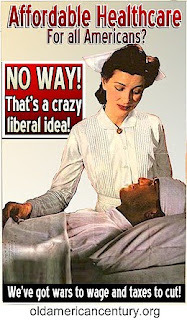 …except when an adequate government health care option might encourage someone to take an entrepreneurial risk or two. …except when it means reducing the shoveling of premiums into insurance companies to produce profits that do not provide any health care benefits. …except when it means placing small businesses in bankruptcy jeopardy over unreasonable medical expenses. …except when it means reforming rules that allow insurance companies to selectively jack up small business rates to rid themselves of less profitable premium payers. …except when government run health care might help small business versus upsetting big pharmaceutical profits that can be used to advertise more drugs for more profits. …except when the political donations and dollar flow for lobbying are just not enough from true entrepreneurial small businesses. …except when a little moral compassion might strengthen our country and small businesses. Insurance companies will act in advance of any eventual triggering of a public option. Here is the most recent possible cautionary tale that ought to compel us to act boldly and decisively to reform health care completely without delay or accommodation of corporate interests. As consumers look forward to new credit card rules intended to make their lives easier, many are also finding that the cost of using their cards is rising. Efforts to compensate for the losses expected from the new federal credit card rules -- some of which take effect Thursday -- are part of what's driving card companies to raise interest rates and fees, some say. "Conventional wisdom says that if one of your large revenue sources is threatened in the future," said Samir Kothari, the co-founder of credit card analysis site BillShrink.com, "you may choose to find other ways to make up that money." Some credit card industry and company representatives, meanwhile, downplay the impact of the new rules -- included in the Credit Card Accountability, Responsibility, and Disclosure (CARD) Act of 2009 -- on card rates. "It's not the leading factor, it's not the only factor, it's a factor," said American Express spokeswoman Desiree Fish. Scott Talbott of the Financial Services Roundtable, the trade group that represents some of the country's biggest credit card companies, said that rising rates are due to the treacherous economy, higher borrowing costs for banks, and consumers with riskier profiles. The idea that banks are raising their rates in response to credit reform is "a red herring," he said. No one disputes that rates are on the climb. A recent study of 150 credit cards by BillShrink found that interest rates on purchases and balance transfers for card holders have grown nearly 20 percent from January to July of this year. Capital One, raised purchase and balance transfer rates by an average of 50 percent, cash advance rates by 20 percent and penalty rates by 30 percent. Citi, which increased its purchase and balance transfer rates by an average of 27 percent. Citi card holders with poor credit have seen their rates increase at least 50 percent. US Bank has increased its purchase and balance transfer rates by an average of 33 percent. In an e-mail to ABCNews.com, Discover framed its rate hikes more in terms of business "soundness" than revenue. Rate increases in response to changes in the law "allows us to preserve the safety and soundness of our business while continuing to lend to credit-worthy consumers," said company spokeswoman Laura Gingiss. Capital One said its rate hikes were due to "external challenges" and the economic downturn, while Citi attributed increases to regular reviews of customer accounts as well as "the dramatically higher cost of doing business." Bank of America and American Express were found by BillShrink to have raised their rates the least, though it's unclear how AmEx would fare were the study updated to include August information: Some American Express customers received letters earlier this month informing them that the company was raising their rates on purchases and cash advances as well as raising late fees. AmEx declined to disclose how many customers had received the letters. Rates, AmEx spokeswoman Desiree Fish said, increased by an average of 4 percentage points for proprietary American Express cards and 2 percentage points for its "co-branded" cards -- cards offered in partnership with a specific company, such as Delta Airlines, Costco and Starwood Hotels. The rules being implemented Thursday are the first phase of the new credit card regulations signed into law this past spring by the president. Most of the rules included in the legislation won't take effect until this February. Experts say that even the few rules taking effect tomorrow will cost credit card companies money. One new card company requirement stipulates that card holders be given at least 45 days' notice before a rate hike. Such advance warning may allow some card holders enough time to pay off or at least pay down more of their balance before they're hit with a costlier, higher rate -- meaning less interest rate revenue for the card company. Another rule requires companies to send bills at least 21 days before they're due. This, some say, could make it easier for consumers to pay on time and avoid late fees or pay off larger portions of their balances, thus shrinking their interest payments down the road. It's unclear how much companies stand to lose from the law -- it's especially difficult to estimate that because card company losses are so steep already, said Peter Garuccio of the American Bankers Association. The companies, he said, are being crunched by their own borrowing costs. A major source of funding for the companies and banks that issue cards was once the securitization market, where banks packaged and sold off assets -- including credit card loans -- to investors. Today, that market is dry and "getting money from investors is a much more expensive proposition," he said. In the meantime, there's no question that the card companies have been aggressive in trying to find ways to raise revenue, said Adam Levin, of the credit education site Credit.com. Levin noted that American Express announced it was dropping its over-the-limit fees -- a move the card company made in response to the reforms governing such fees -- at the same time that it notified consumers of rate hikes. "Even when they do something that looks like good PR move, they're doing something else (too)," he said. "You always have to keep your eye on the entire fee landscape. Just because one is altered doesn't mean they don't make it up with others." Health care reform is so vital that we need to keep pressing Susan Collins very hard. That said, she seems to believe that her recent re-election gives her a pass to do whatever she (or the insurance industry) wants. Here is a recent transcript and very good translation of Senator Collins dancing around the reform debate on the radio posted on Dirigo Blue. We need to retain a very long memory of Senator Collins' lack of concern on an issue so vital to Maine citizens. Reform Rx - Pulling the Trigger for No Bang? Some excellent points about the political realities of Senator Snowe's misguided trigger option. Beware of unintended (or perhaps intentional) consequences! The trigger may serve as the means to delay an effective public option just long enough so that a future Republican insurance industry financed Congress can dismantle reforms in the name of deregulation so that “markets can work”. The trigger option has no bang but will still kill you. Senator Snowe apparently has a liking for triggers. In 2001 as a member of the Finance Committee, she advocated to have a trigger for the Bush tax cuts should the surpluses fall short of projections. The Republican leadership opposed that idea because it understood that the trigger would weaken its core immediate goal of enacting substantial tax cuts and create an open ended potential for the Bush tax cuts to remain a political issue. We’ve seen this movie before! Reform Rx - Sen. Snowe, don't come over for tea. Senator Snowe really ought to just throw in with us, the destructive opposition to health care reform doesn't want her. Unfortunately in the quest for bipartisan support, Senator Olympia Snowe's trigger concept may be gaining ground. It allows insurance failings, already the norm, to be competed against by a public option only if the insurance companies continue their failure for some yet unspecified period of time. In short, grab more profits while you can and figure out how to circumvent accountability in the meanwhile. The trigger option is a weak option that isn't real reform. And shockingly, there is now a move to dilute the inherent weakness of triggers...partial trigger or patchwork use of a trigger! This tepid approach would be tailored so that the public option or government plan would be used only in areas of the country where one or two private insurers control the market and failed once again to reduce costs. Other areas of the country could just suffer and perhaps insurance companies would be able to enjoy "cherry-picking" regions instead of individuals as they do now. Maine citizens need to contact the White House to let President Obama know that Senator Snowe's efforts to abandon the public option do not represent the aspirations Maine citizens have for robust substantive health care reform. We are compelled to bypass our own Senators who are demanding too much under the guise of compromise in exchange for not representing Mainers who voted for the President's health care reform vision. A message from Lee Stanahan, an unemployed father taking on the health insurance industry. Yesterday on the Sean Hannity radio show his guest was Senator Tom Coburn (R-OK), a very conservative Senator and physician, who believes that health care for the less fortunate is just a community concern and not something that needs government intervention. To be fair and balanced, here are clips from CNN and FOX regarding his position when confronted by a woman crying out for help at a Coburn town hall event. What astounded me yesterday while “auditing” the Hannity program for insight into the right wing mind was hearing Senator Coburn mention Senator Olympia Snowe (R-ME) admiringly. The transcript is not freely available. I refuse to send Hannity a single cent and will continue research to obtain and hopefully post the written or recorded transcript. The essence of the conversation about Senator Snowe was that Senator Coburn has been watching her operate in negotiations on health care and reassured Hannity that he is very confident that she is not going to give in on a public option or allow government control of health care. While we hope that Senator Snowe will negotiate in good faith and will recognize the necessity of a public option, we must understand that there are those on the right who equally are pressing her to be their hero. Let’s call upon Senator Snowe to disassociate herself from Senator Coburn’s remarks about her on the Sean Hannity show. Stating that she negotiates in good faith and does not exclude out of hand a public option would reassure Maine citizens that we won’t be treated as dismissively as Oklahoma citizens are by their Senator. Sanity and sense from Erica Jong. This summer the right wing engaged in the predictable effort to knock down health care reform with political slander, misleading scare tactics, and shout down denigration of those who support health care; they even tolerated armed intimidation without condemnation. So here is the “unreconcilable” Republicans summer end position: We won’t compromise on a bill and we won’t support a bill without compromise. Our strategy is lose-lose for Americans who need health care. Our next door neighbor Senator Judd Gregg plans on launching dozens if not hundreds of parliamentary maneuvers if Democrats conclude that using reconciliation is the only possible way to deliver health care reform. The filibuster rule has pretty much outlived its usefulness since we moved from collegial debate to train-wreaking the opposition. The sixty vote super-majority in the non-proportioned-population representing Senate needed to pass anything of substance certainly does not reflect or respect the will of the people. Both bills passed under reconciliation with Senator Judd Gregg's vote. With opposition to health care so intense, it becomes obvious that reconciliation led by Democrats is absolutely necessary. In Maine we ought to keep the pressure on our Senators for moral reasons. But another extended hand across the aisle is not warranted.